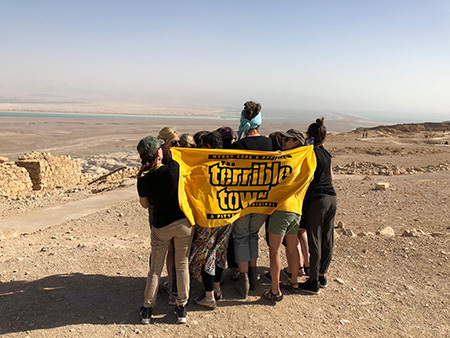 The JWRP cohort from Pittsburgh hold up the ‘Terrible Towel’ while at Masada. When I visited Israel for the first time two weeks ago, I tried to keep concerns about safety in the back of my mind as I traveled an unfamiliar country on a tour with other Jewish women. I need not have bothered, as I was worried about the wrong place. Our trip was courtesy of the Jewish Women’s Renaissance Project (JWRP), and we were among 600 Jewish mothers from around the world that the organization brought to Israel in October. I traveled through Israel with a group of 250, among them 10 other women from Pittsburgh. On Shabbat, the fifth day of our trip, the 11 of us were in the Old City of Jerusalem while 11 of our neighbors were murdered in their synagogue. It was nearly the end of Shabbat, and we had been having a meal in a room below the Old City with walls from Second Temple when news about a gunman at the Tree of Life synagogue in the Squirrel Hill neighborhood of Pittsburgh began to trickle in. The initial information was frustratingly spotty as the room had little cell reception and it took a little while before we pieced together the shocking events. After havdalah, I went to the Kotel with the rest of the women from Pittsburgh to pray for our city. It was only the next morning that I discovered that two of my husband’s cousins—Cecil and David Rosenthal—were among the victims. In fact, many of us had ties to victims of the shooting, to Squirrel Hill, and the Tree of Life synagogue itself, and we felt the losses keenly. That we were in our homeland but not our hometown meant that our small group became the face of the tragedy for everyone in Israel. Over the course of the rest of our trip, we received an overwhelming amount of support from JWRP as well as from Israelis who talked to us, mourned with us and consoled us. The Sunday night after the shooting, crowds came to a candlelit vigil on Ben Yehudah Street in response to the tragedy. One of our group leaders, who works for the Pittsburgh Jewish Federation, movingly addressed the crowd, and the 11 of us held up a Terrible Towel—the bright yellow rally towel associated with the Pittsburgh Steelers. On our final day included an unscheduled visit with Speaker of the Knesset Yuli Edelstein, who not only offered his condolences, but also patiently listened to personal stories. Prior to our trip to Israel, Federation offered to extend our trip by two days so we could visit Pittsburgh’s sister city, Karmiel-Misgav in the Galilee in order to see some of the Federation-funded programs. Seven of us decided to take them up on their offer. In Karmiel-Misgav, we visited a farm helped by nonprofit HaShomer HaChadash, an organization that supports farmers and ranchers in the Galilee and Negev. The farmers had created a memorial orchard grove for the victims, a particularly touching gesture. We planted a tree in the grove for each of the shooting victims; wiping tears from his eyes, one of the farmers told us to come back to eat the fruit. We were also given certificates for each of the victims, to be framed and hung at the Pittsburgh Federation building. Feeling the love of a people who regularly experience loss, fear and pain helped sustain us. Being in Israel made me feel connected to my Judaism; the shooting and Israeli’s responses to it made me prouder to be a Jew. Upon landing at the Pittsburgh airport, signs of changes in the city were obvious. A modified Steelers logo that included a yellow Jewish star and the words “Stronger Than Hate” was on information screens everywhere in the airport. One of the women in the group lives across the street from Tree of Life. When she came home, she described how disorienting it was to see news vehicles lining both sides of her street, with the block nearest to her closed off. Just hours after I landed, I attended the final night of shiva for the Rosenthal brothers. Because of the crowds, it was held at a local synagogue. I brought with me flyers from the vigils I had attended, a Hebrew bible my group received from Edelstein while at the Knesset and rocks from Karmiel-Misgav for family members to place on the brothers’ graves. Cecil and David’s father was touched and asked me to write Edelstein’s name and date in the bible. The following night, I went to a Solidarity Shabbat at my synagogue, Temple Emanuel of South Hills. Over 350 people attended, including many non-Jews. The 11 of us will never know what it was like to be here on the day of the tragedy. Friends described the somber air all over the city with strangers hugging each other and sharing stories. A week after the tragedy, Squirrel Hill streets and restaurants were empty. The feeling of loss was palpable, and will remain so for some time. But we do know what it’s like to be part of a community. We feel Pittsburgh’s love and support, strengthened by our experiences in Israel. Lisa A. Goldstein, MJ, is a freelance journalist who lives in Pittsburgh, PA.
Incredibly moving and well written article. Lisa’s is a sad, beautiful article. Lisa, you captured this surreal block of history as it was and is. Articulate and moving.